When one searches for wholesalers, more than often it’s the middlemen that show up on the results, who charge hefty fees and apply several conditions before they make a deal with you, and eventually the whole process looks like a scam. Simply put, searching for genuine wholesalers can be quite tasking and one has to be extra cautious before shaking hands with them. .
We have written a comprehensive guide on 10 best dropshippers companies. In this section, we will describe the features of Worldwide Brands, which is one of the best platforms to find the most suited Suppliers or Dropshippers. What Is Worldwide Brands ? Worldwide Brands is like a huge directory consisting of certified Dropshippers and Bulk Suppliers or Wholesalers. We can say that they are the leaders in supplying the suppliers since the year 1999 ! They make it super easy for all the retailers, who are searching for genuine wholesalers and want to work with them directly for the product. Retailers get to choose from over 14 million products at wholesale prices, that they can sell on their own web stores with a margin. Worldwide Brands locate their suppliers/ wholesalers through mediums like trade shows. They get the details of each supplier or wholesaler, and perform a thorough investigation on them to make sure they are legitimate. They even pay a visit to the supplier’s warehouses in order to verify their authenticity. They then ensure the wholesalers are willing to work and sell their products on a wholesale price to the online retailers, who will further sell it on their own websites to the end users. They even try to negotiate with the wholesalers to lower the minimums for the Worldwide Brands members. 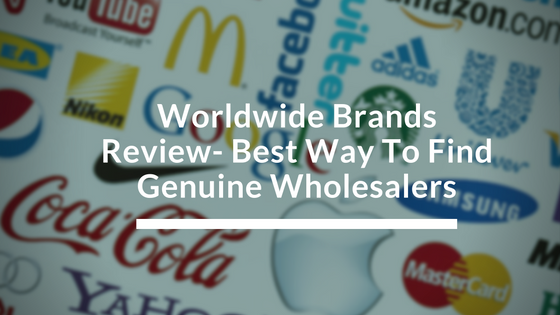 Once the Worldwide Brands find their genuine wholesalers, they certify them and list them on their database. Though the list is made for the international market, most of the suppliers are based in the USA & Canada. This database is regularly kept up-to-date with the addition of new suppliers. And in case a supplier shuts down or is getting bad reviews from other members, Worldwide Brands simply removes them from their list. Worldwide Brands is ideal for experienced online sellers who are searching for genuine suppliers to do business with them, and they KNOW what they are looking for. They are also aware that the items they would be dealing with are expensive and of high quality. Keep in mind that Worldwide Brands have no say or control over the price that would eventually be quoted by the supplier during the ‘light bulk purchases’. It may not be a good option for the new sellers, who are struggling to get a foothold in the retail industry, as the whole process might get daunting and expensive. Is Worldwide Brands Worth Choosing ? Becoming a Worldwide Brands’ member gives you the access to the supplier’s business information only. You can filter search according to your location or product type and get the corresponding results. However, in order to connect with a particular supplier, the seller must contact them directly. Though these tools are designed in the interest of sellers, studies have revealed that they are very basic and may not be useful or relevant enough. The Worldwide Brands boasts about a special forum exclusively for its members, where they come together and take part in the discussions about their business issues, and get advice from experts or more experienced members. It also has a dedicated support team that caters to all queries and is extremely helpful. The Worldwide Brands membership offered, is for a lifetime. It involves no other annual, monthly or middleman fees. They do follow a refund policy, if the need be. Their services could be accessed on the go, as they have mobile apps for both Apple & Android devices. Worldwide Brands lifetime membership comes with a whopping $299 price tag. Despite the costly membership, the free perks are either limited or irrelevant. They also tend to up-sell other services to their members and each comes with a separate billing. Salehoo and Doba are considered good alternatives to Worldwide Brands. Doba is a decent drop-ship service provider for retailers in all type of businesses. It has a rich collection of tools and resources that can be put to good use while creating a web store. Retailers have a choice of over 2 million products from hundreds of manufacturers. Salehoo is comparatively cheaper. It has it’s own list of approximately 8000 legitimate dropshippers and manufacturers who can provide you with maximum profits, with over 1.6 million products to choose from. It is also equipped with powerful market research tools, forums and seller’s training centre. Worldwide Brands services can be availed if you already have the right experience in online retailing and are thorough with what you want to sell and how. If you are serious about your business for a long term and want to expand it with more products, you can be benefited with the opportunity of connecting with the certified wholesalers globally, that too, for a lifetime. It’s obviously a good idea to keep yourself protected from the other fake wholesalers or scams. With the membership price already on a higher side, along with the extra need created just for up-sells, the beginners should stay away. Apart from a rich but useful directory, Worldwide Brands don’t really have anything else to offer.